This is the story of Joan of Arc’s first trial. No, it’s not what you think. In fact, before Joan had to stand before the judges arguing for her very life, she was on trial twice. And as I wrote, above, this is the tale of her first encounter with the forces of justice. But, first, for better understanding of this trial, a glimpse into her youth. Asked if she received the sacrament of the Eucharist at other feasts than Easter, she told the interrogator to move on. Then she confessed that when she was aged thirteen, she had a voice from God to help her to guide herself. And the first time she was greatly afraid. And this voice came around noon, in summer, in the garden of her father, and Joan had not fasted on the preceding day. She heard the voice on the right-hand side, towards the church, and she rarely heard it without a light. This light came from the same side that she heard the voice, but generally there was a great light there. And when Joan came to France, she often heard this voice. Asked how she saw the light which she said was there, since this light was to the side, she gave no reply, but moved on to another matter. She said, in addition, that if she was in a wood, she clearly heard the voices coming to her. She also said that it seemed to her that it was a worthy (digna) voice and she believed that this voice had been sent from God, and that, after she had heard this voice three times, she knew that this was the voice of an angel. She said also that this voice had always protected her well and that she understood this voice clearly. Asked about the instruction that this voice gave to her for the salvation of her soul, she said that it taught her to conduct herself well, to go to church often, and that it was necessary that she should travel to France. 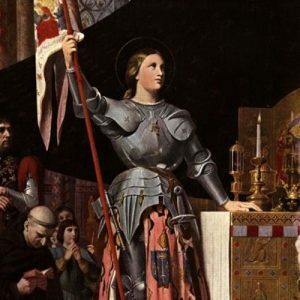 What was not mentioned at this time of her trial (capital “T”) was that at her first vision, she vowed not only to accept the command to go and fight as a man for France, but also to accomplish this mission as a virgin. In spite of her fright at her initial mystical experience, Joan had the presence of mind of know that she needed to make a vow of chastity, at least for the duration of her assignment. Now, a note of her father’s reaction to Joan’s proclamation of her messages from God: he told her brothers that if she tried to leave home in order to pursue her vision, they should catch her and kill her. How’s that for tension in the home? Not surprisingly, Joan’s parents, in perhaps an attempt to head her off at the pass, arranged for Joan to be married at the age of sixteen. For the time, this was considered a somewhat young age for a girl to be betrothed, but perhaps Joan’s parents felt a bit of urgency in the matter. After all, if she were settled in her own home, she might forget about God. Because of her resistance, the matrimony could not be performed. So the young man sued Joan for breach of promise. And so Joan went to court. She is sixteen. She is a peasant. She is uneducated. And so she represents herself before the judge. Who would expect anything less of her? Her argument was that she saw clearly that her summons to act on behalf of France would require her to remain single and simply unmarried, but chaste by vow. She also asserted that she, herself, had made no vow to the young man pressing his suit. This was, she declared, the only time she disobeyed her parents. She argued that obedience to God came before obedience to her parents. Because, I imagine, of her willful composure, Joan won her case and was released from the marriage contract. Of Joan, Thomas Basin, bishop of Lisieux, wrote not long after her death, the following. Regarding her mission, and the apparitions and revelations that she said she had, everyone has the right to believe as he pleases, to reject them or not, according to his point-of-view or way of thinking. What is important regarding these visions is the fact that Joan had herself no shadow of a doubt regarding their reality, and it was their effect upon her, and not her natural inclination, that impelled her to leave her parents and her home to undertake great perils and to endure great hardships — and, as it proved, a terrible death. It was these visions and voices, and they alone, which enabled her to believe that she would succeed in saving her country and in placing her king on his throne. It was these visions and voices which finally enabled her to do those marvelous deeds, and accomplish what appeared to all the world as impossible. Hi. I recently learned that what I am is a mystic. I am Roman Catholic. Would it be too much to ask you to kindly recommend some internet communities? I would very much appreciate the comraderie as it can leave one feeling rather separated from others. I, too, have a special place for Joan of Arc in my heart. Thank you so much for writing to me. It’s a matter close to my heart. I have been looking for communities since I decided to “come out” as a mystic. But, for me, in terms of a real conversation about mysticism, instead of cute, little quoted statements, I have not found what I want. I hope this doesn’t offend you. There are communities on Facebook, such as the Holy Disorder of Dancing Monks. There’s even one called Christian Mysticism and Spirituality, which may appeal to you. Outside of Facebook, in its very limited offering on this, I have found very little. I have been working on a website for the Christian healing prayer ministry (www.findingsolace.org). It’s not finished, getting there. But if you want to look it over, that would be fine with me. You are stimulating into thinking about how we (if we wanted to be a “we”) could offer such a meaningful community ministry in the world. Please let me know what you think. My personal email is gwiz25@gmail.com.